Sal de Ibiza Fleur de Sel e Rose - Sea Salt With Rose Petals - 4.4oz. View More In Fleur de Sel. What started out as an April Fools' joke has resulted in this beautiful Pink Ribbon crock filled with Sal de Ibiza's award-winning fleur de sel and rose petals and a pink ribbon. 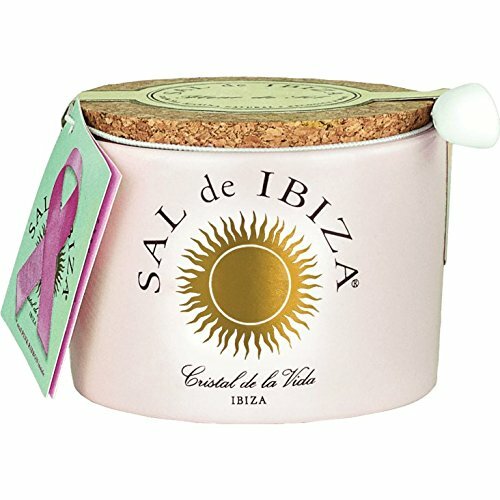 Sal de Ibiza and The Gourmet Online will donate a portion of the proceeds from this limited edition crock to aid in the fight against breast cancer. The floral notes of this finishing salt are a perfect match with chocolate desserts, such as fudge, truffles, and mousse. Use it to complement the flavor of fish, seafood, poultry, and game meats; try it in a salad dressing or over vegetables. Want to make cocktail hour a little fancier? Rim your glassware with this beautiful salt! FEATURES The fragile "Fleur de Sel" crystals only form in conditions of abundant bright sunshine, low humidity and gentle winds. It is a surprisingly mild, yet very aromatic and a tasty salt. Sal de Ibiza is a completely natural sea salt with no additives of any kind. It is obtained solely by the natural evaporation of seawater and contains more than 80 minerals and trace elements. A quality salt like this lasts forever and adds both color and flavor to each dish. The floral notes of this finishing salt are a perfect match with chocolate desserts, such as fudge, truffles, and mousse. Use it to complement the flavor of fish, seafood, poultry, and game meats; try it in a salad dressing or over vegetables. Want to make cocktail hour a little fancier? Rim your glassware with this beautiful salt! like any fine sea salt it is more saline in taste - It's "saltier"
If you have any questions about this product by Sal de Ibiza, contact us by completing and submitting the form below. If you are looking for a specif part number, please include it with your message.